On Tuesday, May 2, CSC’s Toronto Chapter is hosting its regular dinner meeting, which will also feature an overall general introduction to stainless steel. 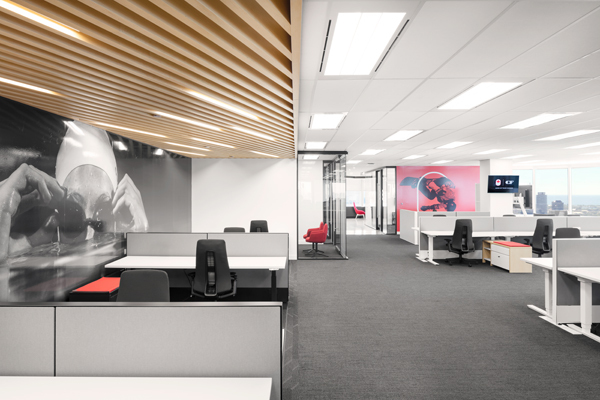 Sports visuals are integrated into the new Toronto headquarters of the Canadian Olympic Committee. The Canadian Olympic Committee (COC) has moved to its new Toronto headquarters, located on the 30th floor of an office tower. Designed in collaboration with creative firm Sid Lee Architecture, the 1301-m2 (14,000-sf) office is home to COC and the Canadian Olympic Foundation staff, Olympians, and partners, allowing them to come together and promote the values of the Olympic Movement. Sports visuals are integrated into this space, representing athletes from Team Canada. Dry-erase vinyl wall murals serve as a canvas for team meetings. The directors’ desks are highlighted with an architectural wood ceiling, and glass walls allow for visual contact. Open-air workspaces are bathed in natural light. Each workstation is equipped with a storage unit, also used as a cushioned divider. Hanging lights with felt panels enhance the acoustics in meeting rooms and private workspaces. The town hall is the office’s main meeting area. It can accommodate around 100 people. The town hall’s bleachers are inspired by mountains, ascension, and performance. It features a ‘Virtue Is Victory’ mural, inspired by Team Canada’s campaign for the PyeongChang 2018 Games. This piece, by artist Ben Johnston, gives the space depth and rhythm.